"Cory Catfish Question" Greetings - I read with interest and anticipation Anne's question ( http://www.wetwebmedia.com/FWSubWebIndex/armoredcatfaqs.htm, "Cory Catfish Question") as she described the current behavior of one of my fish quite accurately. After weeks of wondering, reading, medicating and worrying, I thought to myself "Finally! The Answer!". 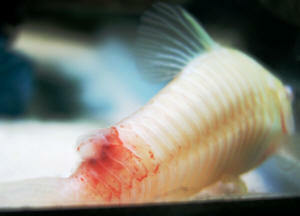 Alas, it was not to be, as Anne's Cory expired before a full examination could be conducted. 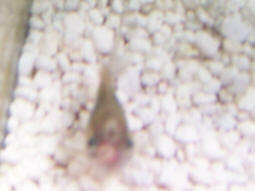 :-( Like Anne's, my fish is not staying down on the bottom as per usual. It is swimming, upside down, at the top of the tank and diving down to the bottom every once in a while. Until recently I thought it had trouble getting to the bottom, when I noticed that it sleeps on the bottom of the tank, so apparently not... 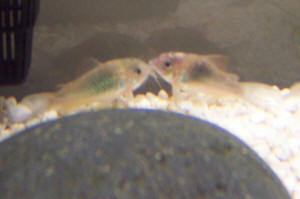 Comparison with a like fish (I have two of the Albino Corys) shows that the one acting strangely has dark blotches inside its abdomen. Both fish seem to be a less active and less interested in food than I remember them being. Neither fish has grown much since I bought them.